We are hopping into spring here at the Wallace Family Life Center. The After School Program has been a continued success with approximately 45 children enrolled for the 2012-13 school year. We have an excellent group of teachers again this year, who work very hard and are dedicated to helping the children with their homework assignments, school projects and more. Our group of students are always eager and excited to learn, have fun and come to the Center each day. 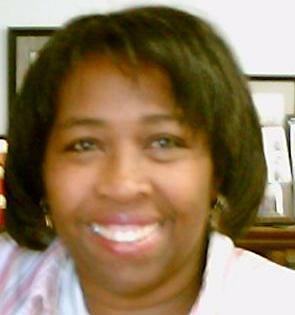 On behalf on the Wallace Family Life Center, I would like to extend a Big Thank-You to all the wonderful volunteers, churches, United Methodist Women and parents who come out during the day to help or donated in any way to make all the programs here at the Center run smoothly! We will soon be gearing up for our annual Summer Reading Program and hope to see a combination of new and old faces among the attendants. We are looking forward to a summer filled with fun, learning and field trips! Please don't forget that the Center is always looking for help from the Community. Volunteers with special skills such as carpentry, electrical training, and retired educators are needed. In addition, we are asking that all of our United Methodist Women and United Methodist Churches please assist us in our efforts to raise money for our building fund. 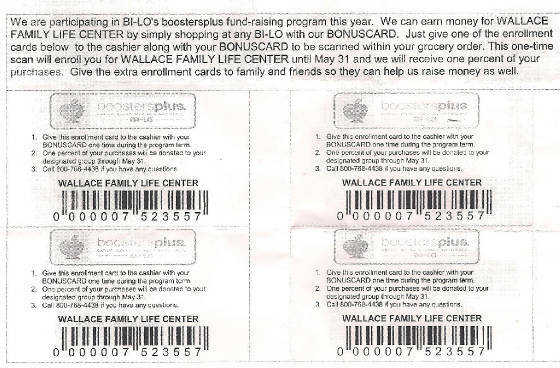 You can also assist the Center by printing out the Bi-Lo BoosterPlus Barcodes below and using it with your next purchase at your local Bi-Lo. 1% of your total purchase will go towards helping us raise money for the programs we offer. If you prefer you may also call or email us with the number of UMW in your group to request key chain Bi-Lo BoosterPlus Barcodes. Click picture to for larger size to print.